When Can You Throw Away Your Export Documents? Ever get in one of those moods where you’re ready to toss every single page from every single stack of paper sitting in a filing cabinet or bookshelf? Me too. But if you’re an exporter, you shouldn’t be too quick to throw away your export documentation. Although it may seem like a headache to keep all your paperwork around, there are quite a few rules regarding export document retention. If you do toss your export paperwork without paying attention to those rules, you could be in for an even bigger headache. For most exports, the general rule is to keep your export documents for a minimum of five years. This is the standard for most agencies that have a hand in exporting, including the Bureau of Industry and Security (BIS), U.S. Census Bureau, U.S. Customs and Border Protection (CBP), the State Department’s Directorate of Defense Trade Controls (DDTC), the Office of Foreign Asset Controls (OFAC), and other agencies. Be careful, because five years isn’t quite as straightforward as it sounds. Certain agencies and departments date the documentation differently. For example, five years from the date of export versus five years after the export is complete versus five years after an export license has expired. It’s your job to know what those caveats are and abide by them. Even once those five years are up, you still may not be able to toss those records. If a government agency requests information pertaining to a particular export shipment before the five-year period is up, you must continue to keep all the records related to that shipment until you have written authorization to destroy them. Find out each step you should have in place as a part of your export management and compliance program. Different departments and agencies define export records differently. Other documents pertaining to the transaction. The EAR also identifies the dozens of types of records that are exempt from record keeping requirements. You can see the list here. The Foreign Trade Regulations (FTR) require that all parties in an export transaction be able to provide "EEI, shipping documents, invoices, orders, packing lists, and correspondence as well as any other relevant information bearing upon a specific export transaction" within five years of the date of the export. The International Traffic in Arms Regulations (ITAR) states that anyone who is required to register with DDTC to export items "must maintain records concerning the manufacture, acquisition and disposition (to include copies of all documentation on exports using exemptions and applications and licenses and their related documentation), of defense articles; of technical data; the provision of defense services; brokering activities; and information on political contributions, fees, or commissions furnished or obtained, as required by part 130 of this subchapter." The ITAR requires that these records be maintained from five years from the expiration of the export license or other approval or from the date of the transaction when using an export license exemption. As mentioned above, the EAR requires exporters and their agents (including freight forwarders) who export "commodities, software, or technology from the United States and any known reexports, transshipment, or diversions of items exported from the United States" to abide by these record keeping requirements. The FTR expands that requirement to include all parties in an export transaction including the owners and operators of export carriers, U.S. Principal Parties in Interest (USPPI), Foreign Principal Parties in Interest (FPPI), and authorized agents including freight forwarders. 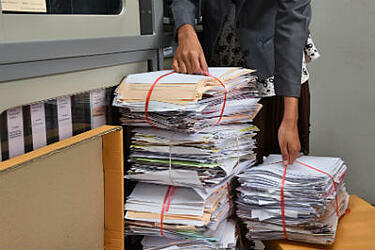 To be blunt, record keeping is one of the most critical tasks you have as an exporter. In case of an export compliance audit, you must be able to find all pertinent documents related to any export transaction from the last five years at a moment’s notice. The Office of Export Enforcement will not make an exception for you just because you’ve stored older files in a facility 300 miles away. In fact, doing so will only illustrate that you’re ignoring best practices. 10 Time-Saving Tips for Creating and Organizing Your Export Documents. If you don’t take control of your record keeping and you are audited, you could face fines and penalties that end your career as an exporter. Knowing when to keep and throw away export documentation is just one part (although an important one) of a larger export management and compliance plan that reduces risk of export control violations. You can get all the details for creating one in our white paper, How to Create and Implement an Export Management and Compliance Program (EMCP). Just click below to get started.